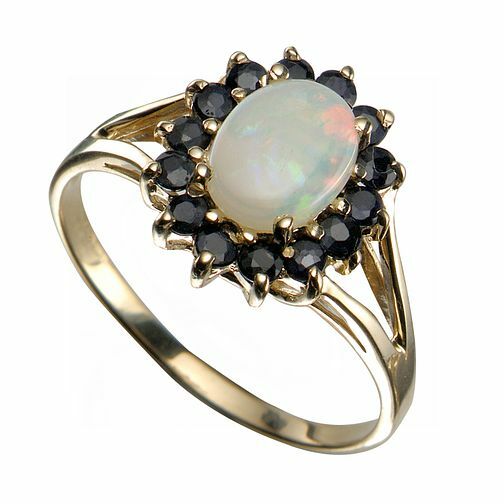 This unusual ring features a shimmering opal surrounded by 14 brilliant cut sapphires to create that classy vintage look. 9ct Yellow Gold Opal And Sapphire Ring is rated 5.0 out of 5 by 6. Rated 5 out of 5 by Anonymous from Pretty ring Very pleased with this ring which was a risk buying on the internet. It looks just like the picture and fits very neatly on my 4th finger. It looks expensive but was within my budget. Rated 5 out of 5 by Anonymous from Beautiful Ring The ring was delivered quickly and is just as pictured.